Although specific areas of the curriculum have been highlighted, we plan for all areas to enable the children to experience a variety of play-based activities during their time in Nursery. At Rockmount nursery we aim to tailor our topics to suit the children's needs and will choose the up and coming topics after getting to know the children and finding out about their interests. There will be many varied and exciting activities on offer each day. The children will listen to stories and songs and even enjoy some children's Zumba! Both inside the classroom and in our outdoor learning environment, children will be able to explore and experiment through water play using a variety of equipment including funnels and tubes, water mills, mini nets, bubbles and much more. 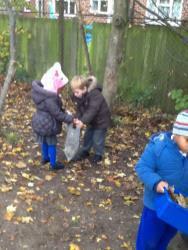 They will investigate sand; building sand castles and using little diggers in role play activities. There is also a large creative focus with endless model making possibilities using recycled materials, lots of decorative elements and of course glitter! Construction is very important in Nursery and children have access to a wide range of construction toys and equipment such as Lego, Duplo, train sets, cars, Tap Tap, 2D and 3D shapes and lots more! Mark-making is an integral part of Nursery life and children will be provided with opportunities to draw and write throughout the Nursery environment as well as in a dedicated mark-making area, with mini books, stencils, whiteboards and pens and a range of varied mark-making tools. Mathematics is also key and will be provided through a wide range of exciting counting games, resources and activities. ICT features throughout the Nursery setting and is used on an individual basis through educational games and programmes on desktop computers as well as the use of the Interactive Whiteboard for whole class ICT activities. During the first few weeks of Nursery, the children have been settling in well. We have been encouraging and supporting them to form positive relationships with their new peers and the adults that will be working with them this year. 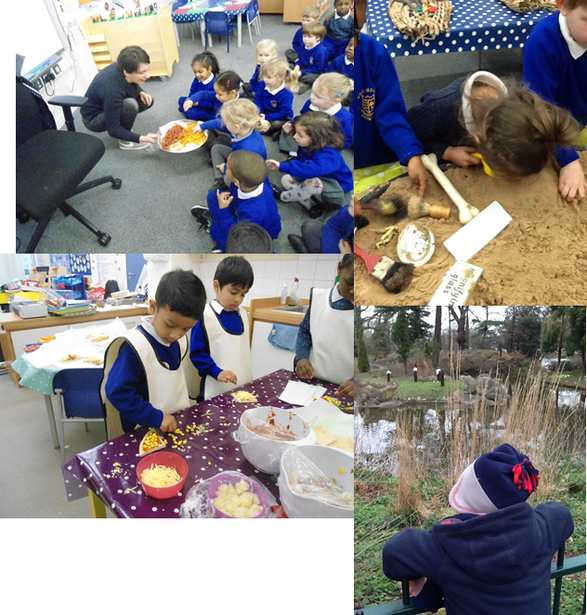 The children have been exploring their new surroundings and engaging in activities from all the areas of the foundation stage curriculum. Silver class have been participating in lots of group games and activities such as circle games, storytelling, outdoor races and many other exciting things in order to develop their social and relationship forming skills. 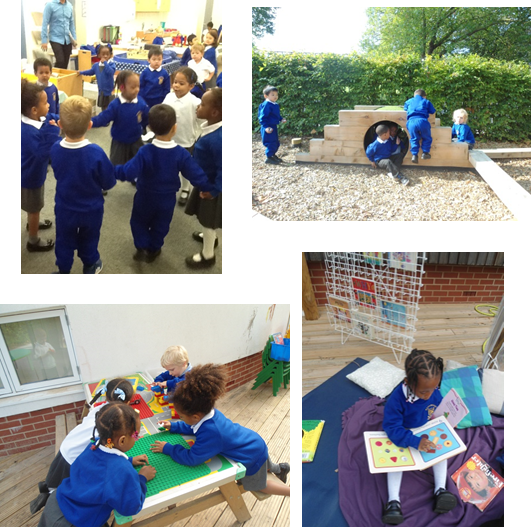 They are thoroughly enjoying the outdoor environment and have used lots of different construction materials to make buildings and cars and other objects as well as developing their sports skills. We have been using the workshop table to design and make models using junk recycling and have been getting creative with paintings. Have a look at the photos below to see what we have been up to. 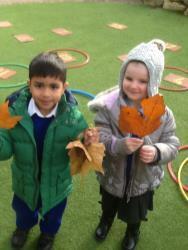 Silver class had brilliant fun on during our Autumn focus and very much liked our Autumn walk where we collected lots of different Autumn leaves. 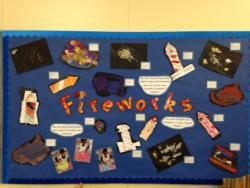 The children really enjoyed learning about Bonfire Night and Christmas. 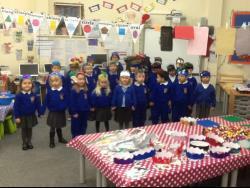 They worked hard to learn some short Christmas songs that they performed to their families and friends. The first half of the Spring term sees us exploring the world we live in. We will be getting our passports at the ready to travel the globe in search of all the wonderful and exciting places we come from. We will begin our journey right here in the United Kingdom, sipping tea and eating an abundance of scones! Our next stop will be Italy! We will be making pizzas and learning more about the language, culture, flag, food and traditions. Our next flight takes us to Africa, where we will be exploring Somalia. Our last stop will be Eastern Europe where we will take a trip to Poland seeking to find out more about the traditions, food and language. The second half of this term, we will be going back in time to explore the ancient creatures; Dinosaurs. We will be taking a trip to Crystal Palace Park to see the dinosaur statues and learning lots about these amazing prehistoric creatures. We will be dipping into the topic of Spring and reading the story; Jasper's Beanstalk. We will planting our own beanstalks and learning about what plants need to grow. The last term of the school year has been an enjoyable one and the children have loved learning using both the indoor and outdoor environments. The first half of the term we explored the deep blue sea and all the creatures that live in it. We had a special focus on sharks and we also learnt about pirates and mermaids! We explored water play a lot during this half term and loved playing our outdoor maths fishing game. This half term (Summer 2), the children have been learning about Space. We have used both stories and factual books to learn more about the planets in our Solar System. We have also enjoyed 'Healthy Schools Week', the children took part in our mini sports day and made a delicious healthy snack of pea hummus, crudities and pitta bread. The children are now entering the transition phase of the year where they will be free to explore the Reception classrooms in order to prepare them for their onward learning journey.